The specs called for a “cruising mainsail” with a 6″ headboard and 24″ roach for a 14 tonne vessel averaging 5000 NM each year. Somerset Sails quoted the sail that way, but we got nothing like that. Instead we got a very poorly made sail. 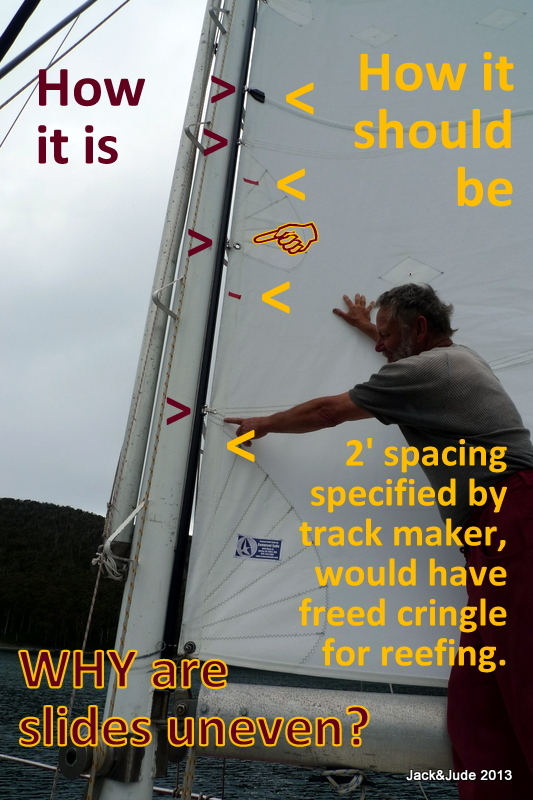 We always wanted a mainsail with a large roach, and by golly, when buying a brand new sail, especially one with full length battens, we should have gotten what we paid for or at least been consulted. Therefore we suggest that you Do Not Buy a sail from this loft or you may get a poorly made sail like this one and get abused when you complain. Why are the slides higgedly-piggedly? If Somerset Sails had laid them out correctly we would have been able to pull the first reefing cringle down to the reefing horn. Tides Marine recommend 2′ spacing between their slides. Somerset set some at 1′-6″ then others at 3′-0″ Somerset put slides on the reefing cringles, against the track maker’s recommendations, instead of leaving them free to engage the reefing horn. Second issue here: They punched holes straight through the panel seams. Why weaken the seams further? There is no reinforcing tape on any edge. When reefed, the luff rope is out of play, therefore all the vertical tension is then taken by that simple sail fold-over and those seams could let go after the sail has gone a few thousand miles. Is this a proper clew on free footed mainsail doing 5000 NM each year? We believe it’s way too small, there should be web strapping spreading the load. Banyandah weighs around 14 tonnes. Would you trust this to claw off a lee shore? The batten pockets are one layer of cloth – nothing more. Battens Pockets are places of high wear and yet this “heavy duty sail” has the poorest and weakest. Why? None of the sail’s edges are reinforced. All are a simple wrap-over of the sail. 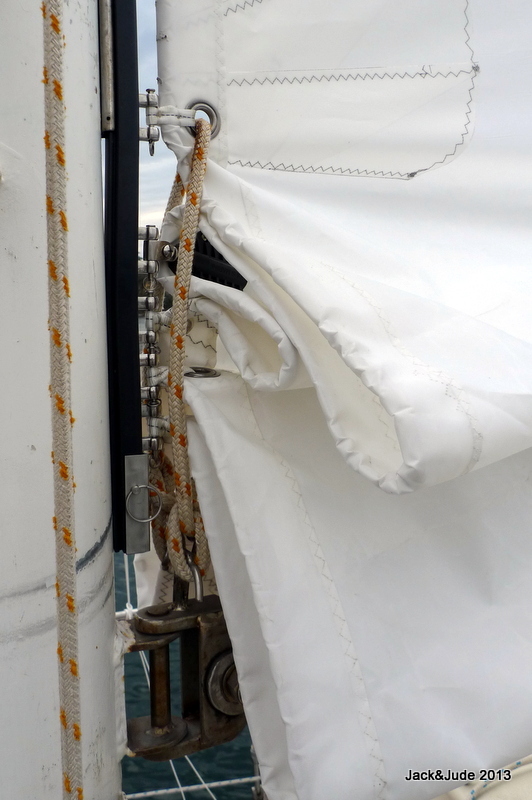 On “cruising sails,” a sail that is used on a daily basis and does a lot of miles, it is standard to reinforce the edges to stop a seam from ripping as thread and cloth weaken with age. This is completely wrong. 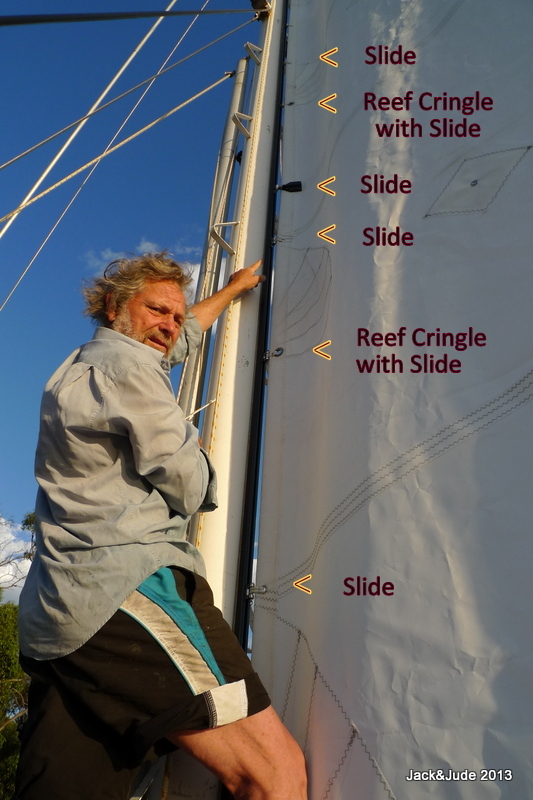 We never recommend sail slides “at the reef cringle”. There is usually a slide just above or below the reef point. We recommend that the installer use our 2” reef slides at THESE points rather than our 1 3/8” intermediate slides…never at the cringle. Tides Marine have been GREAT throughout this process. They promptly made up a sample track for us to trial fit, sent it air express at no charge, then when we gave them the OK, they made up a beautiful one piece track that easily slid inside our old track. This is the head that Somerset Sails made for Banyandah, when we had specified, and paid for, a 6″ headboard. This head definitely needs strops of webbing to transfer the load to the built-up layers. But the cringle is so small it will be hard to fit proper webbing. Do you see how the sail has crinkled and bunched up below the reefing eye? 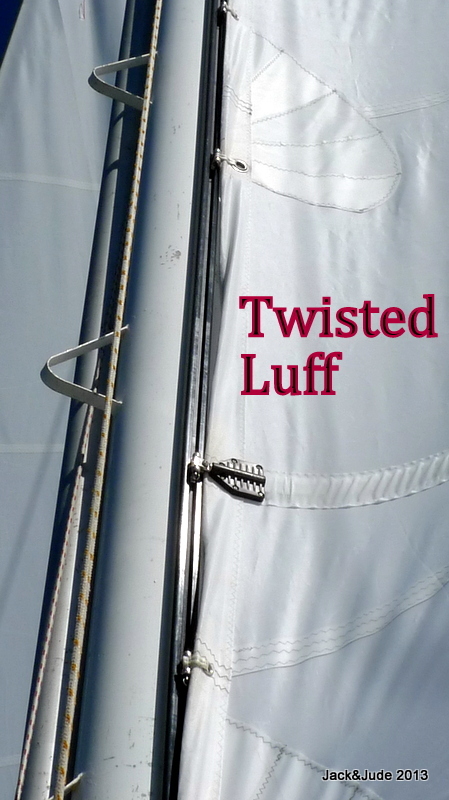 That is because the luff rope is no longer restraining the vertical pull from the halyard. All the stress is now being taken by the simple fold over seam. And because the edges are NOT reinforced, when the stitching wears and the cloth ages, points of failure will be created. Notice also how small the reefing cringles are? All the cringles are tiny. Why don’t we just return to sail to Somerset Sails? REMEMBER – We are in Australia – Somerset is in New York. Of course the sail track system has been installed, and the cost for shipping the sail back to New York is over $300. Therefore it is best for us to strengthen the sail best we can and then move on. Craig wrote to us on the 4th of July reporting on his troubles with Martin of Somerset Sails, in a similar sad story confirming the man is difficult. Here’s his letter. We cruised over 950nm last season with a mainsail we thought we would replace two sessions earlier. We got caught in a thunderstorm that left four inches of hail in the cockpit. It also left us with two ripped batten pockets and three missing battens. With a good three months of sailing to go here on the Great Lakes we found a used sail on eBay for sale by Somerset sail loft . 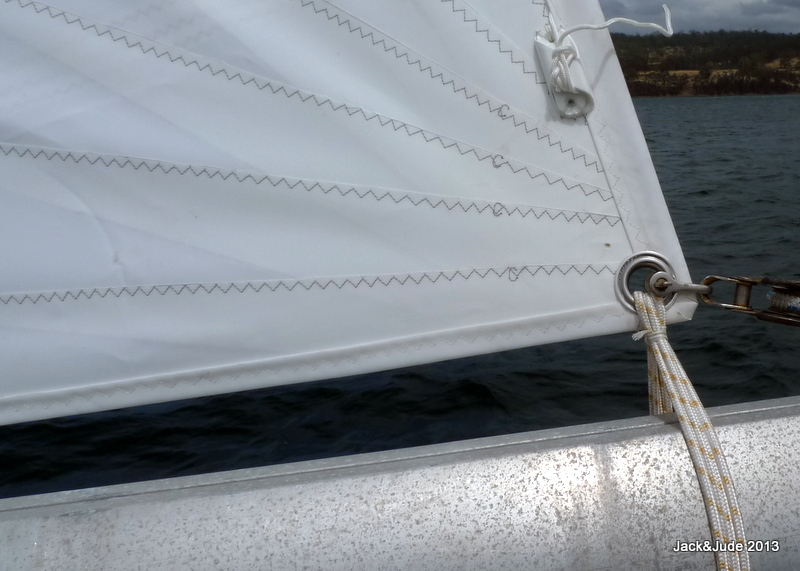 The ad stated that it was in good condition, and for $650.00 we figured we could finish the season with this sail and get a new main built over the winter. When I called to confirm that the sail would fit our tall rig,I spoke with Martin,he offered to make me a new main for $1375. I told him that I wanted the used sail to get us through the rest of the summer and I would look for a new main when back on the hard. Martin said he could have a new sail to me in ten days to two weeks. And, because he was not busy he would drop his price to $1150. Again I told him that I was only interested in the used sail at this time. After a few phone calls and wanting to leave home port again soon, I foolishly allowed Martin to talk me into his new sail. Two weeks went by, when I called, apologies ,excuses, and promises. This went on for months. Then the bullying, and yelling at me that I was unreasonable, that I was making up things he never said. By now time to resolve getting my money back through PayPal ran out. After my daily calling, I finally got the sail. When it arrived, it seemed that the cloth looked good, but the cringles were small and the slides looked few and far between. I again called, this time in addition to the bullying and yelling there was name calling. Martin said I should send it back if I was unhappy, that I was not a sail-maker, had no idea what I was talking about. Would not refund until the sail was returned. By this point, no more time was left to order a sail and have one custom built to our specs . Figuring we would cut our losses and just live and learn, we hoisted the sail. It was short on the luff, and even shorter on the leech, but powered up in light air with out unfurling the jib. Even though I was always admonished by Martin that the main is a “steering vane” and does not power the boat. Well second trip out, with people on board for a nice weekend sail now that our weather finally broke only to be disappointed! I took it to the North Sails loft here. Where we were hoping that for a few dollars we could have a sail that we could cruise with this summer. The only good news is that there is a very good used sail for sale. And the seller is sympathic to our ordeal and this sail seems like it was built for us. From time to time we receive emails from disappointed clients of Somerset Sail, and we like to post them all so our followers can have a clearer picture of the company they are thinking of doing business with. BUT we must have legitimate email addresses to verify the comments. We can with hold publishing your email address. ALSO, please remember that a picture is worth a thousand words. Sorry to hear of your experience. Martin can be a quirky guy to deal with, no doubt, engineers usually are. But he does know about sails and foils. I have bought many sails from Martin, and he has always built me a beautiful, fast sail at a price point that is hard to beat, especially for something not built offshore somewhere by child labor. I know of others that have had some odd customer service issues, none of which that weren’t resolved, but never on construction quality. I have recommended Martin to many others that have been very please with his team’s work and price. I don’t post this to dispute any difficulties others have had, only to point out that there is always another side to consider. 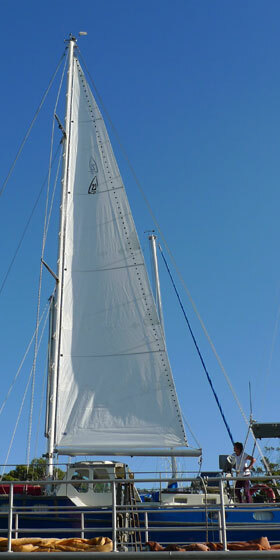 I will be ordering a full set of sails for my Ericson 27 soon, and it will be Martin and Somerset that will build them. Nice website. I enjoy visiting. Good to hear Dave – Glad you got good service from Somerset. Maybe they are cleaning up their act. We did not get such good service and the other matter that prompted us to act was the outrageous and discourteous dialogue we had over the phone when trying to sort out a solution. Our sail was crap (pencil in Poorly Made). Not even worth the postage to send it here. Again glad you had success. We received this comment and tried to contact Tim Taylor using the email address given on the form, BUT our email bounced! Maybe Tim wants to protect his privacy BUT We have no way to verify this comment and publish it with that caveat. Tim if you read this, Pls send me a email so we can verify your comment. Hi Jack not a good story but also a great reminder of the benefit of getting sails made by a reputable loft close to home. I launched my 43 ft cruising yacht in Ballina last year and had the sails made by Rob White at Evolution Sails on the Gold Coast. An hours drive away. They weren’t the lowest price and also not the most expensive but they made nice sails that fit well and drove down themselves for the first fit – I had one small problem which they fixed with no issues at all. I used them on a couple of recommendations from far more experienced sailors than me. Thanks for commenting, and good advice. Although in our case we had an arrangement with that loft to promote his sails here in Australia in exchange for a jim-dandy cracker of a mainsail to take us to NZ. Didn’t work out. He’s a untrustworthy lad as we found out. Oh well, got to take these opportunities on our budget and mostly we’ve found people ring true. But as you say with sails, it’s nice to see the work before you order or pay. I just got my new jib from Martin after waiting a year. He took an old sail and patched it after promising me a new sail..
Only wish I could post the pictures to support my disappointment. you can send us a few low res photos and we’ll put them online. Sorry that you’ve had a such bad experience. We should make other boaties aware. 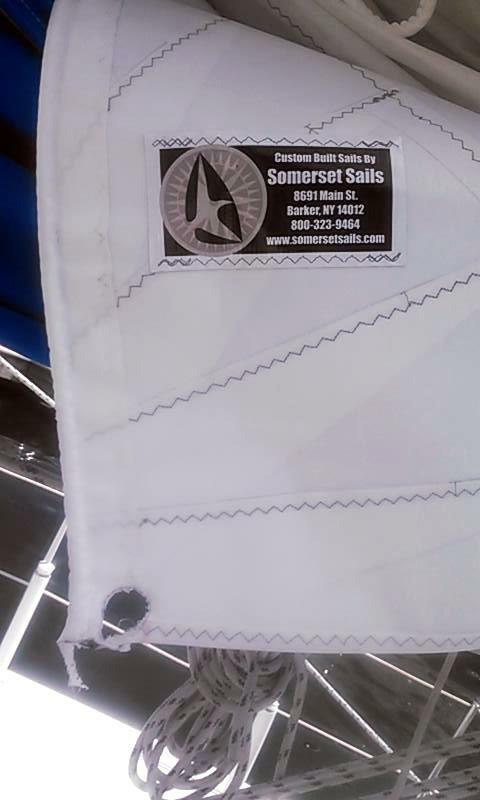 After waiting over eight months to receive our mainsail from Sommerset Sails only to be disappointed on the first trip of the season when the Tack cringle ripped out. Every time we called Martin to be again promised that the sail would be made and shipped immediately. And then to wait, this went on for weeks of calling. Then Martin would try to bully by saying that he was offering such a good deal. He claimed that there was a flood that destroyed much of his loft. And that I was the one being unreasonable by not being sympathetic. Even after he promised it would take 10 business days, and we would have the sail last August 2014. We took it to the local sail loft, only to be told that it was not worth putting money into to try to make the sail right. Please do yourself a favor, don’t waste your money or time with them. It’s true that if the deal sounds too good, it’s not!!! helpful post. I live in NY and was recommended to try this loft. Not now. Thanks for your candor. We paid a cheap price for a very cheaply made sail when we thought we were getting a good deal on a well made one, which is what we need down here in the Southern Ocean. Being verbally blasted by the owner when we complained put him straight in our bad books. FYI after a year and 7000 miles, the mainsail looks rather sad. I’m sorry you have had such a terrible experience. Last summer I bought a new headsail from North sails. On the very first sail we got t boned by another boat putting a large rip in my brand new sail. When I called North they said to get it to them quickly. I found they not only repaired the rip they replaced whole panels. The only cost to me was the shipping. This is the way a sail loft should treat it’s customers. YOU ARE NOT AN HONEST MAN????? is he kidding! I have been a sailmaker and been in the industry my whole life, won’t comment on the sail? Honest man? he’s got some nerve! That’s a shocker! I do not claim to know too much about sails but I definitely know a shoddy job when I see one. 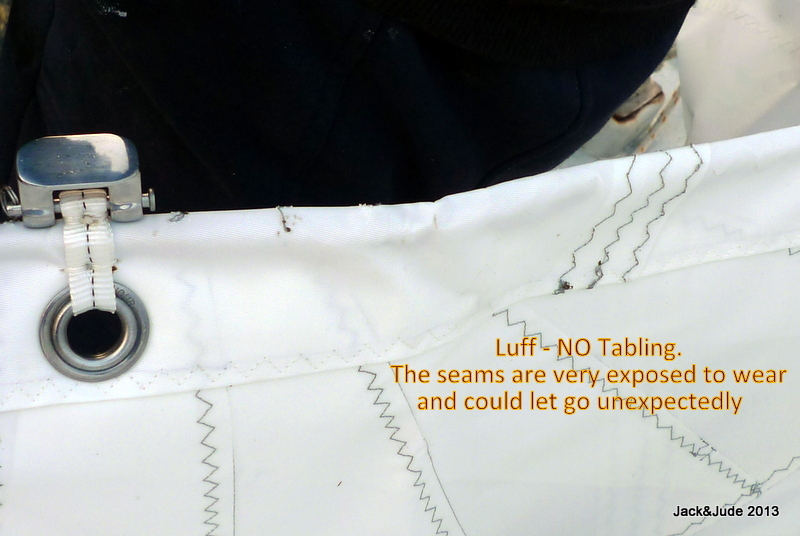 Is it not possible to find a professional sail maker who can inspect the sail and write a report on the shoddy nature of the job and then make a claim through fair trading? It will all be behind you one day soon, just the bit in the middle getting in the way. without going into all the other stuff, that’s the worst looking mainsail I;ve ever seen. full of bag already, no chance of getting any shape or power into that! Is this guy a fair-dinkum sailmaker, or just some wally who picked up a sewing machine! Have followed your adventures for a while with a degree of envy. Keep living the dream! Sorry about the massive disappointment with the main. Oh Jack and Jude, that is a shocker and I’m sorry to see that happen to you guys. As a fan of your writings (own Two’s a Crew, Tassy cruising guide and SA cruising guide) I am disappointed you have been treated so shabbily. 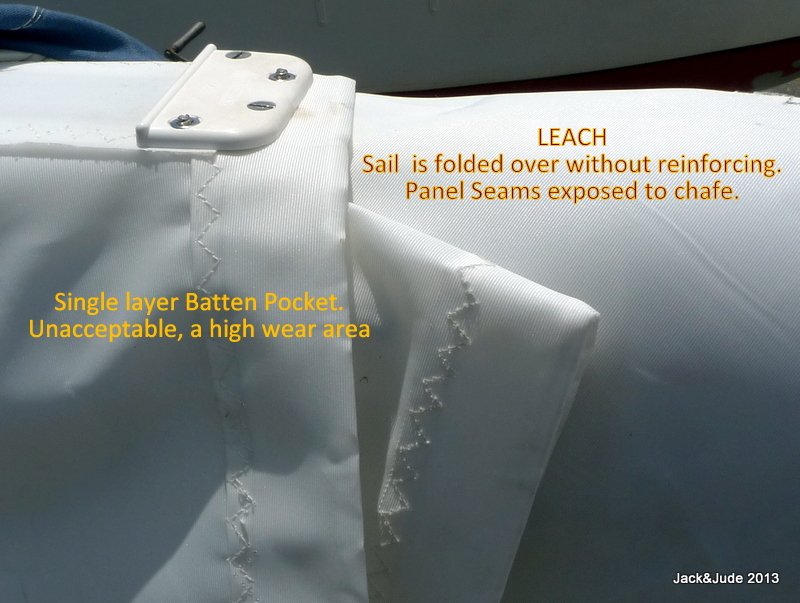 Can you get the mainsail resown with extra reinforcing along the luff and batten pockets? On my Hood mainsail I have slides at the reef points and just use some Spectra braid through the cringles to pull it down to the horns. Seems to work just fine. Can’t do much about the Roach though. If I was there I’d help out with my Sailrite sowing machine, however I’m still far in your wake at Port Lincoln and won’t be leaving until Wednesday for KI and then Tassy. Hoping you find a good solution.